It is a given in our media obsessed society that a world famous concert pianist make piles of records. Maurizio Pollini is an exception, having only committed a fraction of his immense repertoire to disc. To rectify the situation the Italian Exclusive label is now issuing some of the pianist's concert performances, mostly in repertoire he has yet to "officially" record. Every bar of these presumably unedited performances attests to Pollini's ability to "sound just like a record". His unruffled proficiency allows no specks or smudges, no blurred lines, not one unbalanced chord, uneven phrase, not one rhythmic detail out of kilter. No wonder Pollini is the role model for most serious piano students. Many critics, however, berate Pollini's cool, emotionally reserved style, the way he stands outside the music he plays. To my ears this is true, but not all of the time. He does burst his bubble occasionally. Certainly this live "Emperor" concerto has a sweep and aristocratic elegance light years beyond the pianist's tinkly, square-toed studio version. And Pollini leads an inspired Vienna Philharmonic from the keyboard in three Mozart concerti, all played with stylish flair and telling detail. Don't expect patiently spun cantilenas a-la Schnabel or Myra Hess in the slow movements, though! Save for the finales of the A Major (K. 488) and C minor (K. 491) the remaining Mozart items and the Schumann Concerto are more typical of the aloof, computer-like Pollini that critics love to hate. At least the Schumann is distinguished by Karajan's impassioned conducting and an uncredited oboist who plays the first movement solos better than anyone I've ever heard! The prize of the batch is a stunningly played set of all twelve Debussy Études. Yes, they could stand a bit more character and breathing room and, indeed, Pollini's recent performances have been broader and more colorful. The Polonaise Fantasie is more powerfully inflected and urgent here than in Pollini's relatively static 1976 DG version. The above mentioned Schumann concerto is coupled with a live Beethoven 4th featuring the late Arturo Benedetti Michelangeli, Pollini's one time mentor. It has little to recommend it beyond curiosity value. The sound, for one, is ghastly, suggesting a tape copy removed at least twenty generations from the source. It sounds no better, in fact, then its previous issue on a bygone Discocorp LP. Still, one can easily infer Michelangeli's brilliant pianistic effects, as he transforms this sublime work into a thrill a minute high wire act, while the hapless Belgrade Philharmonic runs for cover under the big top. 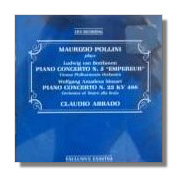 The Pollini items seem to stem from high generation air-checks or in house tapes, and are quite listenable.